In the past, a missing tooth was restored by a dental bridge, which involves cutting two good teeth adjacent to the missing tooth site for placement of a three unit bridge. During the last 10 years, dental implants have become a very popular and well-received solution for replacing missing tooth/teeth. 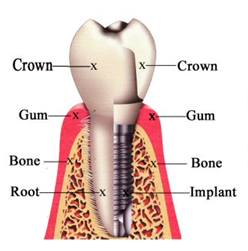 Dental implants are artificial tooth root replacements made of titanium, which are surgically placed into the jaw to replace missing roots so that crowns or bridges can be placed. best suits your actual needs. What do Dental Implant procedures involve? There will be an initial consultation with your dentist at Bondi Dental, followed by x-rays and study models. After careful consideration, studies, and discussions, a treatment plan with its corresponding costs will be prepared and presented. Our Oral Surgeon and Implantologist at Bondi Dental, will surgically place the titanium implants into the jaw. Integration will take about 4-6 months, during which time temporary tooth or teeth will be placed as appropriate. 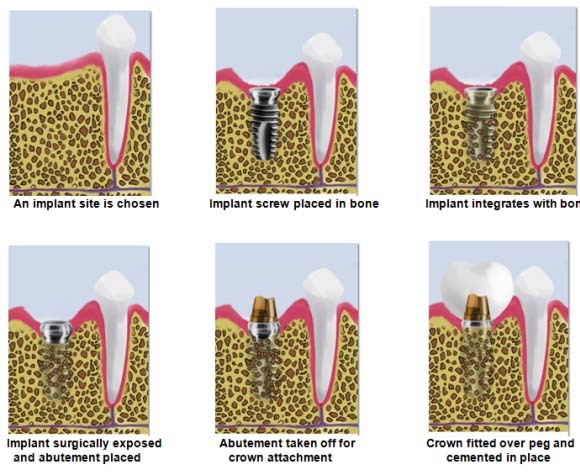 Your dentist will expose the implant, take impressions and create a model upon which new crowns or bridges are based. Because the implants are integrated into the jaw bone, the replacement tooth/teeth will look, feel, and function just like your own natural tooth/teeth. To claim your offer call us on (02) 9365 7187 or make an appointment online.